Aralon: Forge and Flame is one of a few of the truest attempts at doing something like The Elder Scrolls on mobile that I’ve played. It does all the things you want it to, though barely. After all, it is a few years old and built for mobile. It’s ambition is something to appreciate though, and a lot of the bugs I complained about in my review previously have since been fixed. I've also heard good things about another Crescent Moon release, Ravensword: Shadowlands, but I can't vouch for it since I haven' actually played it. Read our Aralon: Forge and Flame review here. Probably my personal favorite pick as a Blades alternative on this list. Fighting Fantasy Legends is sort of a combination between a roguelike and game book. It's a pretty simple rpg (as it uses straightforward, dice-based combat), but it simplicity is part of why it works well for mobile. If you were hoping for a great rpg with traditional fantasy stylings that works well on the go, Fighting Fantasy Legends is a great pick. Read our Fighting Fantasy Legends review here. Battleheart Legacy is a true open-world rpg developed exclusively for mobile. The combat is a bit more like an MMO and the viewing angle is isometric, both of which make it work better for mobile than trying to simply shoehorn The Elder Scrolls onto smaller, less capable devices. Read our Battleheart Legacy review here. If the fit and finish of Blades is what attracted you to it, Cat Quest is a fine substitute. Has a bit of a Diablo vibe, but with a bright aesthetic, and cats! Read our Cat Quest review here. If the real reason you wanted to check out Blades was because you’re all in on The Elder Scrolls lore, there’s a way to get it without having to put up with chest timers and bargain-basement Infinity Blade combat. The Elder Scrolls: Legends is a Hearthstone-like card game that packs a surprising amount of narrative into its single-player campaign. Make no mistake here, this is also a free-to-play game, but a better one than Blades. Read our The Elder Scrolls: Legends review here. If you were hoping Blades’s first-person combat would deliver deep and satisfying first-person sword fighting mechanics, put it down and pick up Severed. 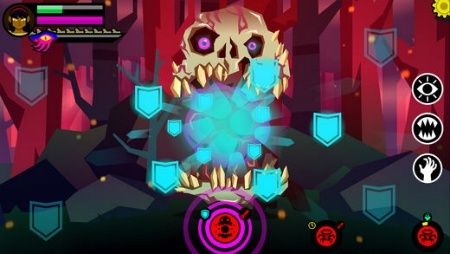 Severed feels like a cross between Infinity Blade and The Legend of Zelda: equal parts open-ended exploration and meaningful, detailed sword combat. It's great and you should play it, whether you are disappointed by Blades or not. Read the Severed review here. This pick is a little out there. Yes, it’s sci-fi, but if what you wanted from Blades was to be your own person in a living, breathing world that reacts to your presence, this is your best bet. It may be pretty menu-heavy, but there’s no other game on mobile I can think of where I can have two ongoing games where I am playing out two completely different lives. Read the Star Traders: Frontiers review here.